If your dog could talk this would surely be your dog's favorite question. Why not make it easier for your dog to get his or her point across? 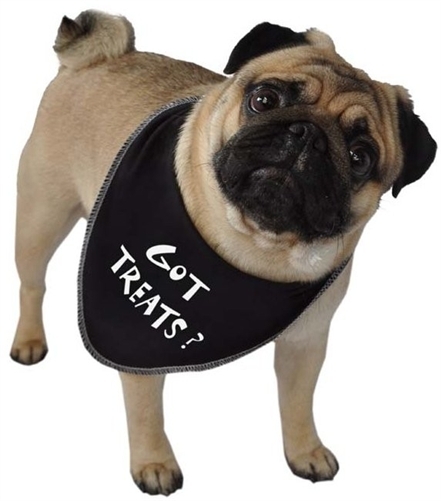 Beware however, that your pups treat intake may go up more than 50% with one of these bandanas! These 100% cotton jersey dog bandanas have a fashionable cover-stitch edge and quality silk screened lettering. They are completely machine washable and prewashed to avoid shrinkage. Bandanas are hand screened in the USA with love. GotTreatsBandana-0001 Got Treats Bandanas - a) Small: L 21" W 12.5"
GotTreatsBandana-0002 Got Treats Bandanas - b) Medium: L 26" W 18"
GotTreatsBandana-0003 Got Treats Bandanas - c) Large: L 37" W 24"